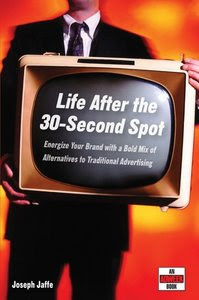 Joseph Jaffe “Life After the 30-Second Spot: Energize Your Brand With a Bold Mix of Alternatives to Traditional Advertising"
The old media strategies advertisers used for decades no longer work. Here's what does! Traditional advertising, in the form of print, radio, and most notably, television, is far less effective than it used to be. Advertising strategies using only these mediums no longer work. Life After the 30-Second Spot explains how savvy marketers and advertisers are responding with new marketing techniques to get their message out, get noticed, engage their audiences-and increase sales! Covering topics such as viral marketing, gaming, on-demand viewing, long-form content, interactive, and more, the book explains the new avenues marketers and advertisers must use to replace traditional print, TV, and radio advertising-and which strategies are most effective. This book is every marketer's road map to "new marketing."